Motoring magazine. Jeremy Clarkson, Richard Hammond and James May race each other across St Petersburg. May drives, Hammond cycles and Clarkson pilots a hovercraft. Jeremy Clarkson, Richard Hammond and James May are in Russia for an incredible race across the vast and very beautiful urban landscape of St Petersburg. 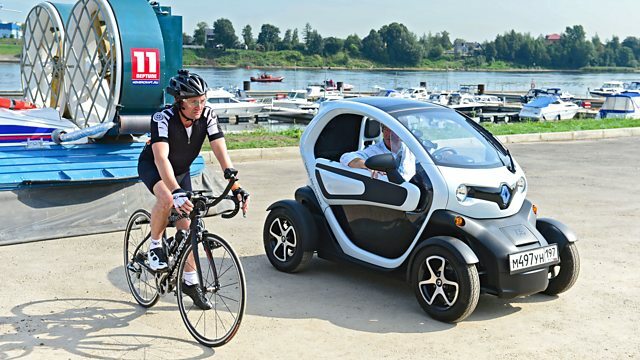 May defends the honour of the car in a very small Renault, Hammond tries to prove that pedalling is faster by saddling up a bicycle, whilst Clarkson attempts to demonstrate that water is the quickest way across town, especially if you're in a hovercraft. To make matters more complicated, all three presenters are racing not only each other but also The Stig, who is silently making his way towards the finish line on public transport. Also in this episode, Richard Hammond is at the test track to find out if the dramatic new Lamborghini Huracan is as flamboyant and fun as an Italian supercar should be. Plus another top celebrity guest tests their steely eyed driving skills as the star in the Reasonably Priced Car.